Washing machine – check. 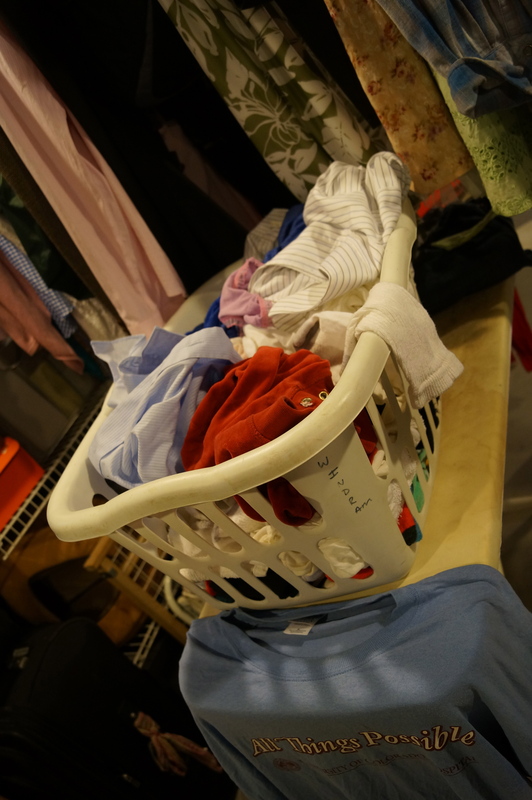 Clothes dryer – check. Detergent and fabric softener – check. Piles of dirty clothes – check and double check. 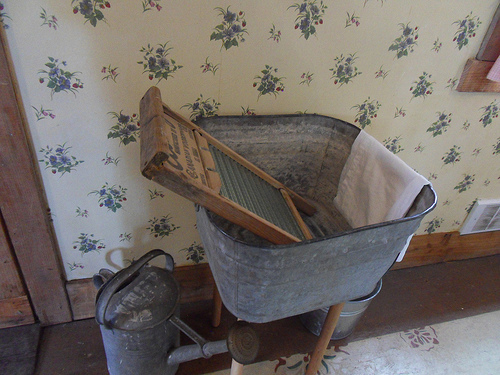 I have all the modern day supplies and equipment to do a load of laundry. Yet, I struggle. I just can’t bring myself to sort, carry, load, unload and fold my clothes. At least not on regular basis. Honestly, I haven’t done a load of laundry in at least two months. And I don’t even really have to wash the clothes; the machine does it for me. Now, I’ll clarify and say that I am not walking around in ketchup stained, smelly T-shirts. 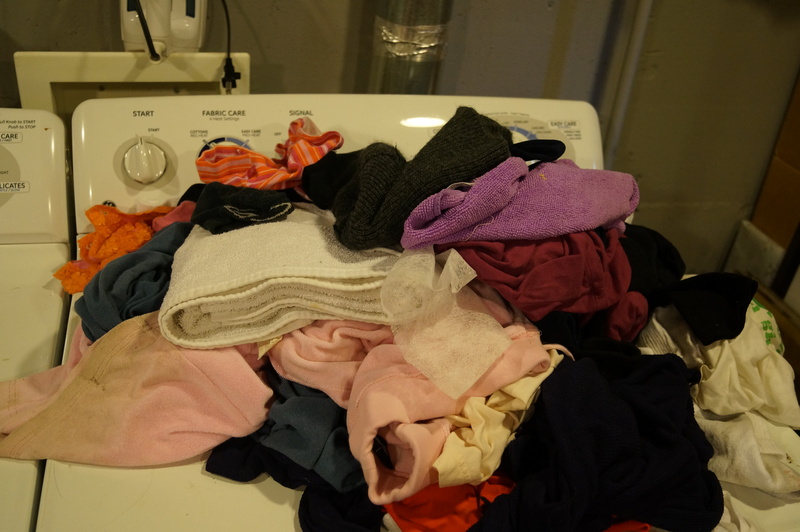 My husband has picked up the slack and lovingly tosses our clothes in the washing machine each weekend. He usually remembers to transfer them to the dryer. But this is where he begins to slack off. Once they’re dry, they sit atop the dryer or on the ironing board or even just live in the dryer for a while. One load in the dryer, where it would probably stay for the rest of the week, except there’s a load waiting in the washer right now. Another load on top of the dryer. And one in the laundry basket on the ironing board, just begging for a cat to come sit in it. Or this – double trouble. Of course, I’m not picking on my husband. This is far better than I do each weekend. He thinks he’s really funny. But what is it about laundry? Why is it I can unload the dishwasher? Or vacuum the rug? They’re not my favorite things to do, but I still do them. Is it because laundry becomes an all day ordeal, even if I’m not actually doing the washing? Is it because it reminds me of all those Sundays getting ready for the dreaded work-week ahead? Do I just hate going in the basement? (I really do hate the basement). Am I just waiting for the day that there’s an App for that? What are your thoughts? Is there something you dread and put off until someone else does it? 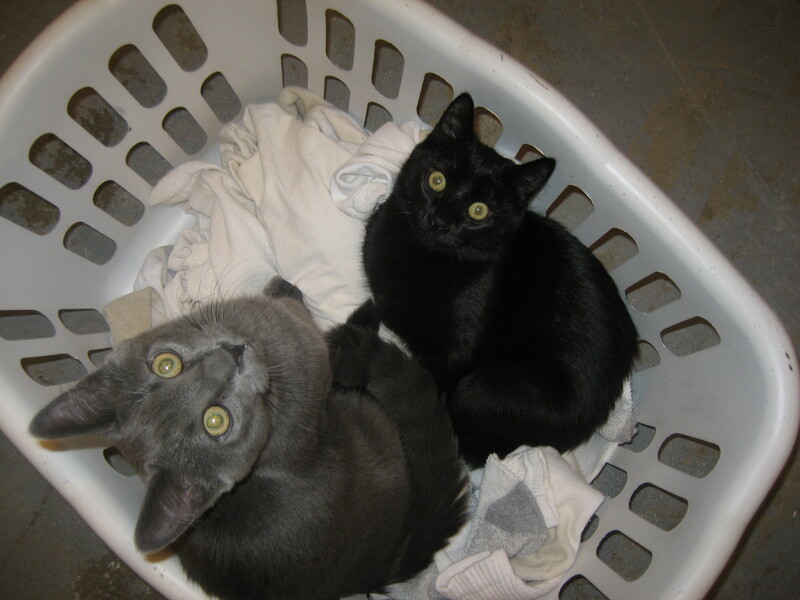 Do your cats go straight for the basket of clean laundry, making it all furry and wrinkly? 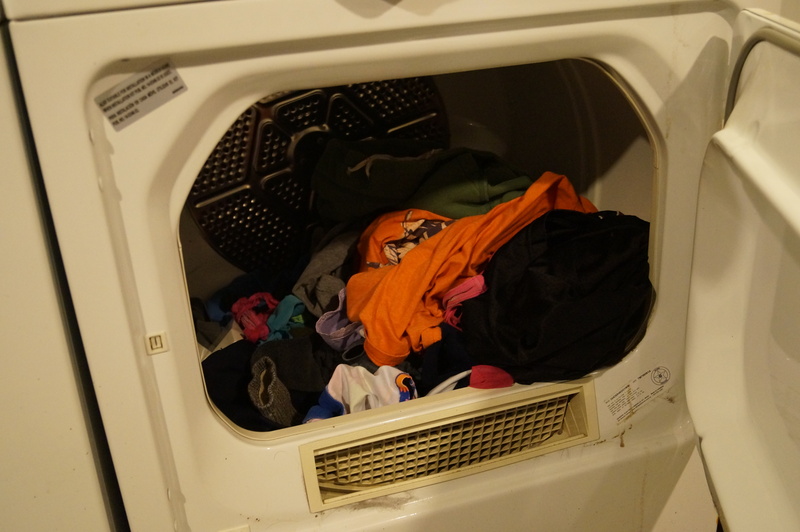 Are you one of those crazy people that enjoys doing laundry? Libby’s Post: What’s with all the cheese? I will say it is nice to just plop plates and cups on the dishwasher rack and move on. But then you have to unload it at some point. 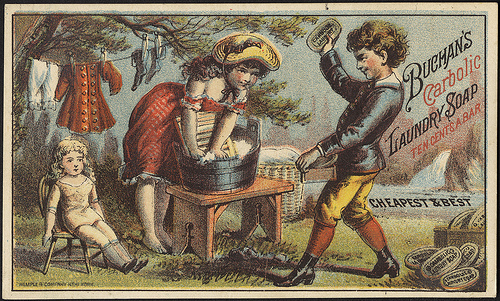 I sort, my thirteen year old son puts the wash in and transfers the load, and I or one of the other kids folds. We do one load a day. It works for us. I don’t mind the laundry so much as the dishes. I too, Ms floczok, have no dishwasher and I have been doing the dishes since I was ten. I hate like poison to wash dishes so I trade off with the kids. Half the time I end up washing the dishes they washed again, but they are learning. Oh, funny, I have often have to re-do the washing that my husband does. He just doesn’t see the things I see, or feel. Sometimes you have to feel the grime on the dishes to know it’s there. Yeah, I don’t really like the grocery store either. I don’t know why, it’s not that bad. And I get really annoyed when it’s really busy and I have to wait more than 2 minutes to check out. 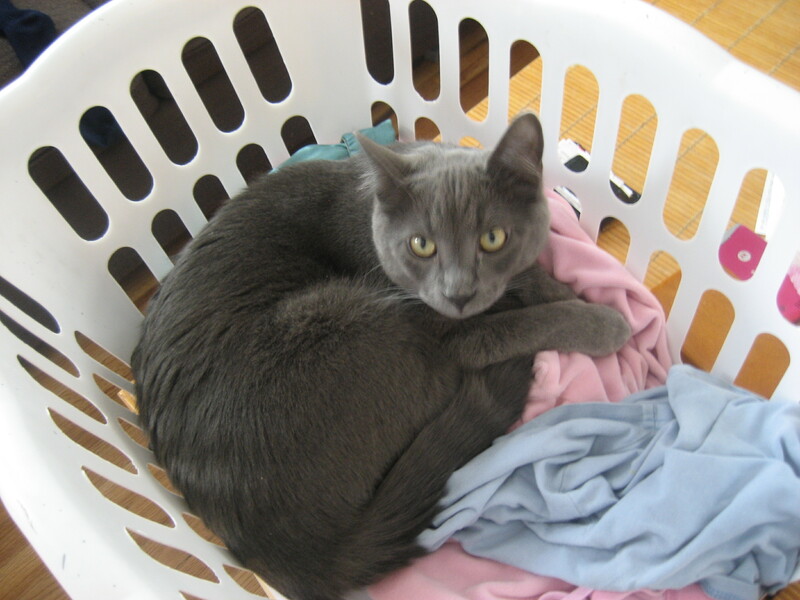 I think cats have a sixth sense for warm, clean clothes. Just like they know how to get in the way of anything you’re doing. Right know one of mine is smack dab in front of the computer screen, pawing at the cursor as I type. Do I move her, no. I just keep craning my head to see around her. Here’s my theory. Your laundry room is in the basement. I hate the basement, I would never do laundry either if I had to go down there. My thing is ironing. If something is in the ironing, it sits there until I want to wear it. Period. Yeah, our basement is pretty icky. It’s unfinished and cold and dark. I try to avoid it all costs. My husband has his workshop down there, so he doesn’t care. He spends all day down there. I guess it makes sense that he does the laundry since he’s already in the creepy basement. I almost never iron anything anymore. I pretty much buy things that don’t require ironing. And I only iron when I need something, not all at once, seems less annoying that way. Not horrified by this, with your washer and dryer in the dreaded basement I totally understand. I don’t mind laundry because my laundry room is right on my main floor. I don’t know what I would do if it were in the basement, like you, my basement might as well be a haunted house, well, there really ARE black widows down there! Anyway, what I hate doing the most, dusting. I think this is because I have so much crap on every surface that I have to remove tons of stuff just to get to the surface that needs dusting and then dust all the tchochkes (don’t know how to spell that) and put them back. Only dust about twice a year, I think, so I am worse than you with your laundry. Oh, dusting. Hmmm… I can’t even remember the last time I did that. Probably right before guests were coming over. And I’m talking REAL guests: people who don’t usually come to my house, so I’m still trying to make a good impression. Family and close friends don’t count. I put off most things but am not too bad re laundry, usually because it is for my husbands shirts and trousers for work. I never iron though. Everything is non iron here. Shirts are hung up straight from the washing machine so they dry without creases. I remember back in the mid 90s my parents were in the US for my Mum’s pen friends wedding when one of the guests asked my Mum if we had washing machines in England… My Mum told her no, that we all still bashed our clothes against rocks in the river. Oh that’s funny. I can actually picture all of England out in the river, washing their clothes. I will say my mother has visited her friend in England a couple of times (I’ve never been) and she said most of the homes where he lives were much older and smaller than the monstrosities that we have out here, so there was less room for all the gadgets and things that we Americans fill our houses with. Not sure if that’s true of all of England or just where he lives (somewhere outside of Manchester). 🙂 well some of us have spaces for gadgets. Oh laundry.. I can never seem to start and finish a load in one day.. nope.. doesn’t happen! haha. Glad I’m not the only one! There’s just something about how it is always there, needing to be done, that I think bothers me. I guess it’s like most chores, shortly after you’ve finished things get dirty again–a never ending cycle of clothes needing to be cleaned. I like tasks where I can cross them off the list and be done with them, at least for more than a couple of days. And the cats. They just know. When I used to do laundry (he he), I would bring the basket up and one of them would be right there, ready to dive in. Same with making the bed. The bed will have been empty all morning and as soon as I walk in and start tugging on the sheets, there they are… It’s the perfect excuse not to get anything done: the cat was in the way. So funny, yet so true. Sometimes our clean laundry has been left wet in the washer sooo long we have to rewash it. Or the cats sat on it long enough to leave mats of black and gray fur, so in the wash it goes again. Sigh… Who are those super organized, spotless house people and how do they do it?? I like the way you blog on real-life. It’s given me a lot of inspiration and thoughts for when I can’t think of anything else to talk about. Thanks. It’s funny, I usually have an idea of what I’m going to write about a couple of days before I even sit down and start typing. But this was a hectic week and Monday came around and I had nothing. I have journal where I jot down random ideas like: I’m afraid of sharks. Then I lob the idea around my brain in *hopes* of finding a funny or interesting angle. But for whatever reason I kept reading my list and nothing inspired me. My muse had abandoned me. Then I went to the basement because my hubby asked that I transition the load he started and I decided the post would be about laundry. I don’t think it’s my best or funniest post, but I hope that at least people can relate. Sorry, only boy in a family of girls and cousins are all married. 😉 He is just a wonderful person. Don’t know how he puts up with me sometimes.